Growing on a Taxodium distichum at the Botanical Garden of Puerto de la Cruz, Tenerife, Canary. Altitude: 0-300 metres above sea level. Habitat: Tillandsia usneoides is an epiphytic plant that grows hanging upon larger trees, occasionally on fences or telephone and electric lines, and often completely covering the trees in tropical and subtropical America. It is found both in full sun and in partial shade wherever the climate is warm enough and has a relatively high average humidity. Ecology: Tillandsia usneoides is a biological nomad, that reproduce very abundantly in the vegetative state by means of the beard-like masses of the plant that are torn off and distributed by wind and stick to tree limbs or used by birds for nest construction. seeds are rarely produced and roots are found only on young seedlings. The water supply available depends entirely on water from rain-falls and mist condensation or that stored in their own tissues. During dry periods, it becomes dormant and waits for waters, to resurrect itself when the rain returns. Rapid and efficient water uptake by specialized trichomes, is therefore very important. 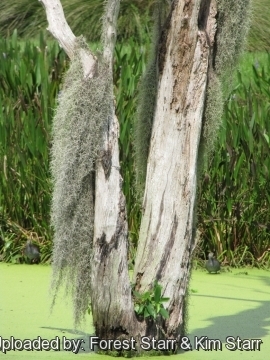 In the southern United States Tillandsia usneoides lives especially on oak (Quercus virginiana) and bald cypress (Taxodium distichum), but it can also dwell on other tree species such as Sweetgum (Liquidambar styraciflua) and pines. The beard-like masses host a number of creatures like insects, rat snakes, and bats. A jumping spider (Pelegrina tillandsiae) occurs nowhere but on Tillandsia usneoides. 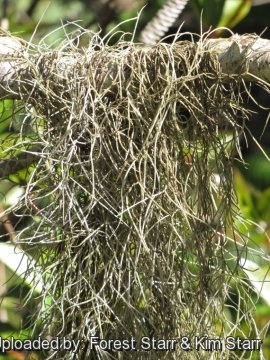 Many species of birds weave their nests right in the Spanish moss and many other kinds of birds use pieces of Spanish moss for nesting material. It is not a parasite. That is, it does not take nutrients or water from the host tree on which it lives. 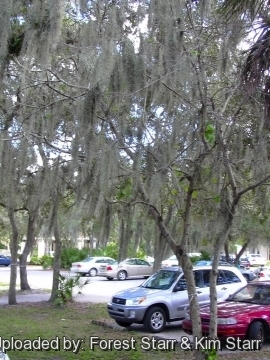 However, occasionally, Spanish moss can become so thick that it shades the leaves of its host, or, when heavy with rainwater, breaks a branch. 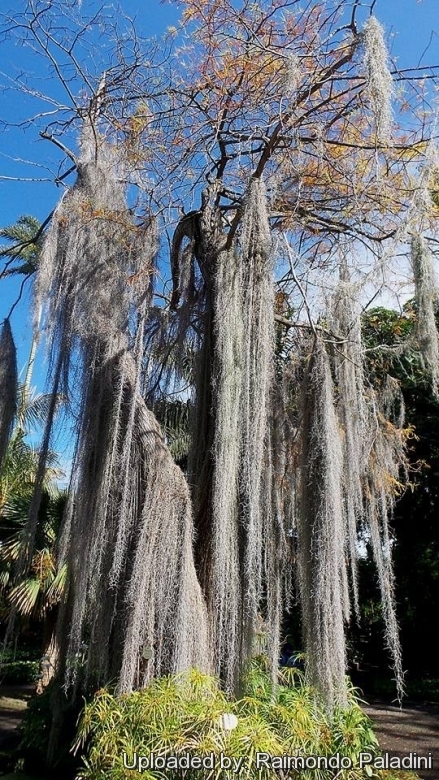 Description: Tillandsia usneoides (Resembling the liken genus Usnea, but in fact it is not biologically related to lichens or mosses) is a a very unusual pendant bromeliad forming long festoons hanging from tree branches up to 3-6 m in length. The whole plant is covered with shield hairs capable of absorbing water and salts (especially calcium) from rain and dew, while those of the related Ananas comosus (the pine-apple), cannot do so. When dry the plant is silvery, like the velamen-covered root of an orchid. Stems: Slender, thin as thread, pliable, and curly, in chain-like fashion (pendant) to form hanging structures, and with narrow grass-like leaves, and only in early youth fixed to the surface of the supporting plant by weak roots that soon dry up. The plants of Tillandsia owe their attachment to the fact that the basal parts of their axes twine round the twigs of the host. Roots: The plant has no aerial roots and true roots are found only on young seedlings. Leaves: 4 to 8, alternate, 2-ranked, thin, often twisted or contorted, grey to silver-grey when dry and light green when wet, 2-6 cm long, 1-2 mm in diameter, sheath pale, narrowly elliptic, not inflated, not forming pseudobulb, 2-4 mm cm wide; blade filiform, succulent, margins involute to nearly tubular, apex acute, densely covered by greyish scales that catch water and nutrients (in dust particles) from the air. Inflorescences: scape concealed within leaf sheath, appearing scape-less, pendent with shoot, ± 1 mm diam. Floral bracts enveloping flower, erect, green, broad (covering all or most of rachis, rachis not visible at anthesis), ovate, not keeled, 4-5 mm , thin-leathery, apex acute, surfaces densely greyish-scaly, venation even to slight. Flowers: Solitary; tiny, inconspicuous and fragrant at night, apparently sessile. The flowers of this species have three sepals and three greenish petals. Sepals free, ovate, not keeled, 6-7 mm, thin, veined, apex acute, surfaces glabrous; corolla spreading, petals spreading, yellow-green or blue, elliptic, to 1 cm; stamens included; stigma included, simple-erect. Blooming Time: Spring to summer. It rarely blooms in cultivation. Fruits: Capsules, up to 2,5 cm long, brownish and splitting in three parts,. The seed pod opens in winter to release dozens of fluffy seeds that drift in the breeze and stick fast to tree branches. 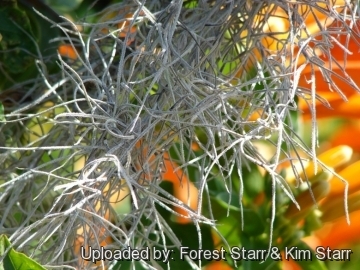 1) Forest & Kim Starr “Tillandsia usneoides (spanish moss, Pele's hair)”. Plants of Hawaii. <http://www.starrenvironmental.com>. Downloaded on 20 August 2014. 14) Nancy R. Morin “Flora of North America: Volume 22: Magnoliophyta: Alismatidae ...,” Volume 22 by Flora of North America Editorial Committee. Cultivation and Propagation: Tillandsia usneoides is very easy to grow, requiring only warm and humid air. It is drought tolerant, and will thrive within a broad latitude of care conditions. Locate in a well ventilated place. In the right conditions it may grow to more than 6 m long. Soil: It is is exclusively epiphyte and needs no soil or transplanting. Exposition: It grows best in a spot with plenty of light Full sunlight to partial shade. In a dark location the plant will gradually weaken and wither. 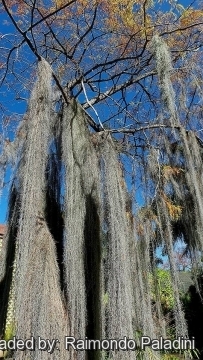 Watering: Spanish moss gets all the water it needs from the rain. In cultivation water the plants by misting regularly with lukewarm water, whilst in winter with low temperatures it is better to leave it quite dry for avoiding possible rottenness. Hardiness: They are sensitive to heavy frost, but can easily tolerate sporadic light frost. However they grow best in a spot with plenty of light, with summertime temperatures of 20-30 C degrees or higher and winter temperatures around 15 ° C. USDA Zones 8 - 11. 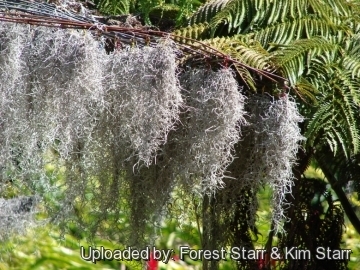 Garden uses: Spanish moss is sometimes hung on fences or wires to create privacy screens. It makes a great mulch for garden. In South America Tillandsia is often used as a balcony decoration. It is often used in decorative floral arrangements and handicrafts. 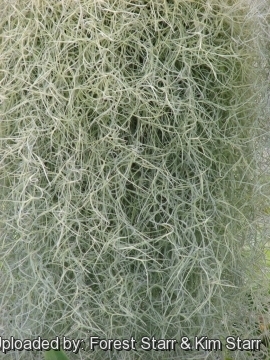 Uses: Spanish moss has long been used as a stuffing and packing material. 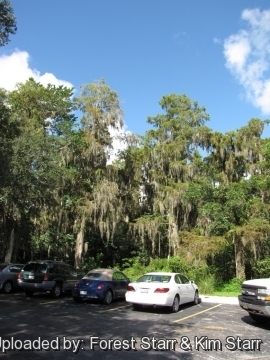 For more than two centuries Spanish moss was harvested commercially, and it were used in automobile seats and for pillow and mattress before the advent of synthetic polyester fibres. This light, dry, filamentous material has even been used in filters for air conditioners and for oil.